Math can be a living source of powerful ideas that transcend mathematics; a window into mind-opening philosophical concepts such as infinity, fourth dimensions, chaos, and fractals; and a practical training ground for developing skills in analysis, reasoning, and thought-if you have the right approach and the right guide. The Heart of Mathematics: An Invitation to Effective Thinking�-now in its third edition-transforms mathematics into an engaging, relevant experience even for the most math-phobic student. Infusing this book with humor and enthusiasm, Edward B. Burger and Michael Starbird-both recipients of the Mathematical Association of America's foremost national teaching award and countless state, regional, and campus-wide teaching honors-introduce students to the most important and interesting ideas in mathematics while inspiring them to actively engage in mathematical thinking. About Michael Starbird (Author) : Michael Starbird is a published author of young adult books. 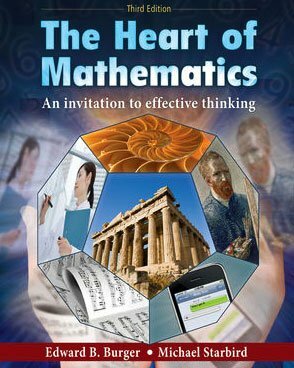 Some of the published credits of Michael Starbird include The Heart of Mathematics: An invitation to effective thinking.